Our experts in this field are able to provide consultation services to support your Cerenkov imaging, partial defects detection, and instrument development needs. Channel Systems Inc. has a wide ranging expertise in the collection and analysis of imaging data. We are intimately familiar with the imaging equipment we provide and can provide consulting service to not only help you select the optimum platform for your application but also help you design the processes that will allow you to efficiently and effectively capture the data you require. Data collection is only part of the task. Channel Systems can also assist with analysis of the data collected or producing customized reporting to meet your needs. The expertise of our engineers extends throughout the process, insuring that every step from collection to reporting is handled professionally. Channel Systems Inc. is the manufacturer of the Digital Cerenkov Viewing Device. 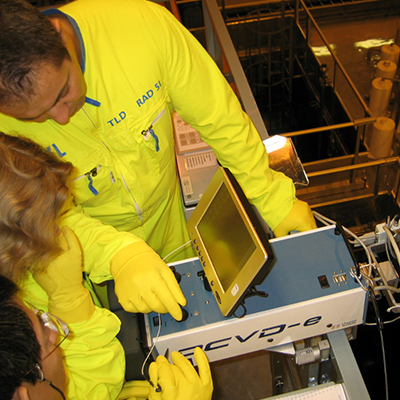 We have an intimate understanding of the process of measurement of spent nuclear fuel using the Cerenkov methods. This experience makes Channel Systems in a prime resource in providing consulting and inspection services for your spent fuel verification requirements.